Martinelli shoes salon for women. Flat shoes and traditional design that provides great elegance and personality to our feet. 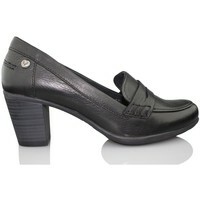 These Pumps are manufactured in high-quality leather that ensures good durability and resistance. Rubber sole. Martinelli Pumps These are available in black color. The Spanish brand Martinelli noted for its high quality skins that make their shoes.